Whether you are looking for a lighting fixture to brighten your foyer, set the perfect ambiance for your formal your dining room, or just add character to any room in your home chandeliers are the classic choice for making a big impression. Chandeliers allow you to express your style in a beautiful AND functional way! Today's modern, contemporary, and transitional styles offer an ever expanding array of fixture designs. In addition to style and materials, there are a variety of other factors to consider when selecting your ideal chandelier, including size, light output, type of light source, dimming options, and more. In order to help you narrow down the choices, here are answers to some of the most commonly asked questions relevant to buying a chandelier. What should I look for when searching for my ideal chandelier? Aside from your personal style, there are three main factors to selecting the right chandelier. The things to consider are : size/scale, the direction of light output (glare versus glitter), and control (dimming). Choosing a chandelier that is too large or too small can result in a disproportioned look in your space. A 30" tall chandelier hanging in the middle of the room with 8' ceilings will feel extremely low in the space and look out of place – not to mention be a hazard for anyone over 5’ tall! If you buy something too small, the piece may seem swallowed by the room. When in doubt, it is better to err on the larger size, since chandeliers are statement pieces. Use the following "rule of thumb" method to size your chandelier to be the focal point of a room. Measure the length and width of the room in feet. Add those two numbers together. The sum of those two numbers should be the MINIMUM diameter of your chandelier in inches. This is just a guide, but it does provide a place to start. You will also want to ensure the light coming out of the fixture does not cause excessive glare. There is nothing worse than sitting at a dining room table with the glare of a bright bulb beaming in your face. What direction is the light shining? Are the bulbs concealed or exposed? In my opinion, EVERY chandelier needs to be installed with a dimmer so you may control the strength of the light output. Looking for a contemporary Chandelier? If your taste runs with a more modern vein and design, focus on nickel or chrome finishes. Bronze finishes are more commonly found in transitional fixtures, which combine design elements from both traditional and contemporary style worlds... Keep in mind that your chandelier's finish and materials should also complement other finishes in your space. How big should my chandelier be in my dining room? Chandeliers are sized by diameter and height. The number of bulbs may also impact size. 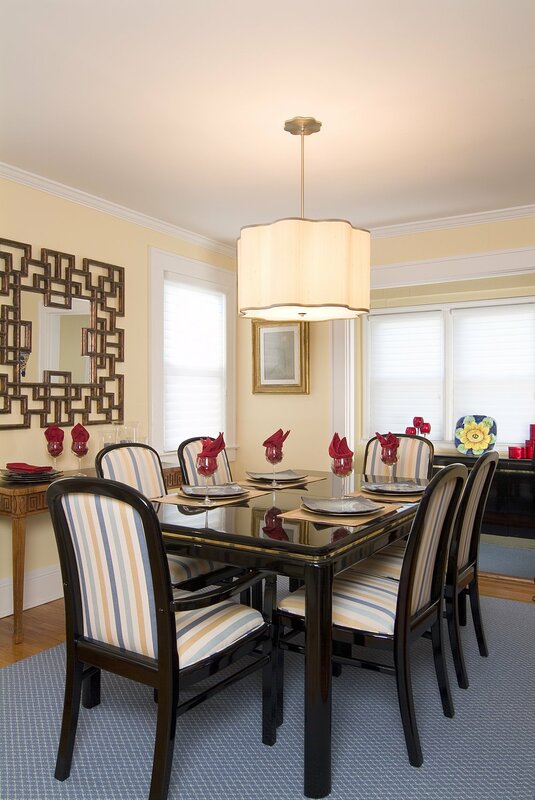 Today's average dining room chandelier is a four to six light, 26-30" diameter fixture. Take ceiling height and chandelier height into consideration as well before purchasing. The chandelier should hang about 30" from the top of your table to the bottom of the fixture itself. (36" is appropriate if your ceiling height is over 9’). Will my chandelier be bright enough to light the whole room? How much light do I really need from my chandelier? Chandeliers are decorative fixtures, meant to impart style and ambiance, so do not expect your chandelier to be a room's primary light source. This is one of the biggest mistakes you can make with a chandelier. Placing a single fixture in the center of a room and expecting it to light the room entirely is a recipe for bad lighting. ALWAYS Remember, the best way to light a room is to combine different layers and levels of light! Chandeliers work best as a supplementary light source and even better when incorporated into a layered lighting scheme. Can I use a chandelier in any other room other than the dining room? Yes, they can go anywhere in your home. Choosing where to install a chandelier depends on the size of the room, ceiling height, size of the fixture, and the surrounding décor. They can go anywhere as long as your ceiling height can accommodate one! The great news is that most manufacturers have begun to offer selections of semi-flush mount fixtures that are the same width as larger chandeliers without the height restrictions. Just keep looking…. it’s out there! Are there any other factors I should consider when choosing a chandelier? Sometimes it's good to have something unexpected rather than going for a "safe" look. Make sure it's something that you love and can live with for years to come. The Age-Old Question - Granite Or Quartz?